Once upon a time there was a ship. It was a very grand and very beautiful ship that sailed off to explore unknown frozen lands. The ship had a big and very exciting adventure with 48 brave men on board. That ship is called the RRS Discovery and those frozen lands were Antarctica, home of the penguins. The once upon a time was 1901 and really was a long time ago now, which makes The RRS Discovery rather an old girl. So she has come to rest up and be looked after and admired by many in the wonderful city of Dundee. One day, during a ship pampering and restoration session, some of the her teak timbers were removed as they were quite damaged and needed renewed. As well as a huge ship the city of Dundee now houses a rather wonderful bar. This bar is really pretty fantastic as the people who run it are really big on making friends with everyone around them. They open their doors not only to beer and beer lovers, but to to creativity and to thinking outside the box, so there are always interesting happenings going on to get involved in. From puppy parties to meeting the brewers, Beer Schools to art exhibitions and a whole heap more including tasty eats and board games a plenty! This bar is called BrewDog Dundee and it has just celebrated its first birthday. When the beer dawg moved into town the people were all very excited, as the beers they brought with them are the most splendid of beers. They will take you on taste adventures not only around Scotland (where BrewDog beer is brewed) but from all around the world, because they like to invite their beer buddies to come and join in the fun at Dundee, and let us taste their brews too! One day a girl walked into the new BrewDog Dundee Bar and got to chatting over a beer. 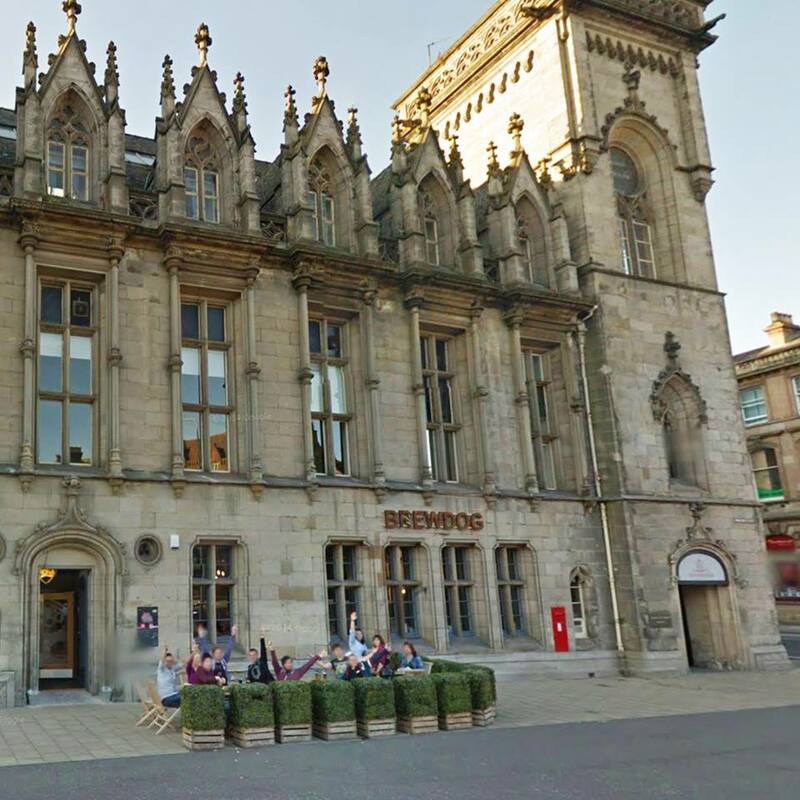 Well actually, between you and me, she told them that she thought that their bar was lovely and the beer tremendous… but that the toilets were really pretty dull (especially compared to their brother BrewDog Aberdeen, who sports a whole riot of colour and a whirlwind of crazy characters). In a nutshell, said that she thought that she could liven them up a bit. Random, yes, I mean who cares about toilets!? But everyone has to visit them at least once when drinking all the beers don’t they? And really, who doesn’t want to smile when they are… washing their hands! Anyway, I digress. She got the job. That was when the BrewDog Circus came to town. It was the biggest illustration print that she had ever made, and with the help of her wonderful assistant, she set to pasting this monster up. (Quite the task for someone who has never wallpapered in her life might I add!). 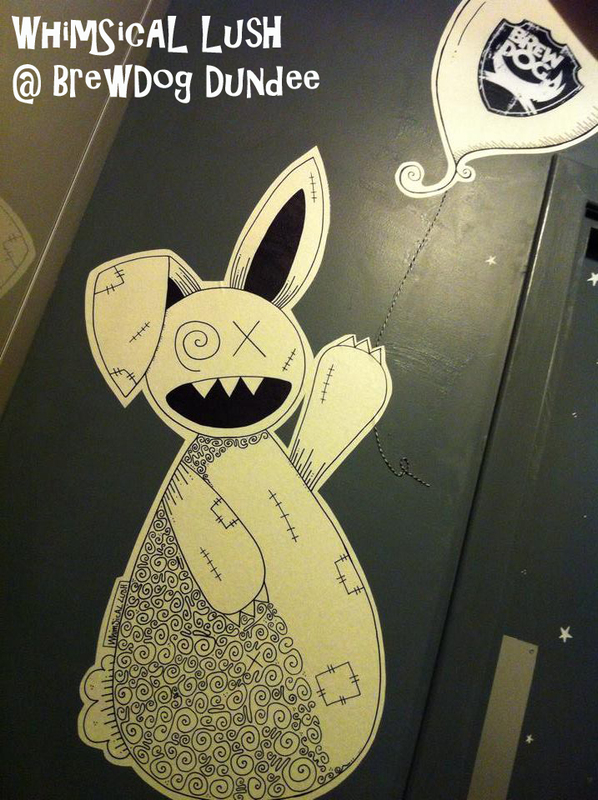 This was quickly followed by some original hand drawn houses and towers, vines and stars… and a huge zombie rabbit! Her artwork started to creep out into the main bar as well and various creatures and magical dwellings started to appear on chalkboards too. But to get back to the ship and her wonderful leftover timbers. Every year BrewDog bars all over the country do this thing they call collabfest. Basically, each bar choose a brewery that they think makes awesome beer too and they get to plotting and planning a wee beer adventure together. Last year for #collabfest2014 they got together with Alechemy Brewing in Livingston. 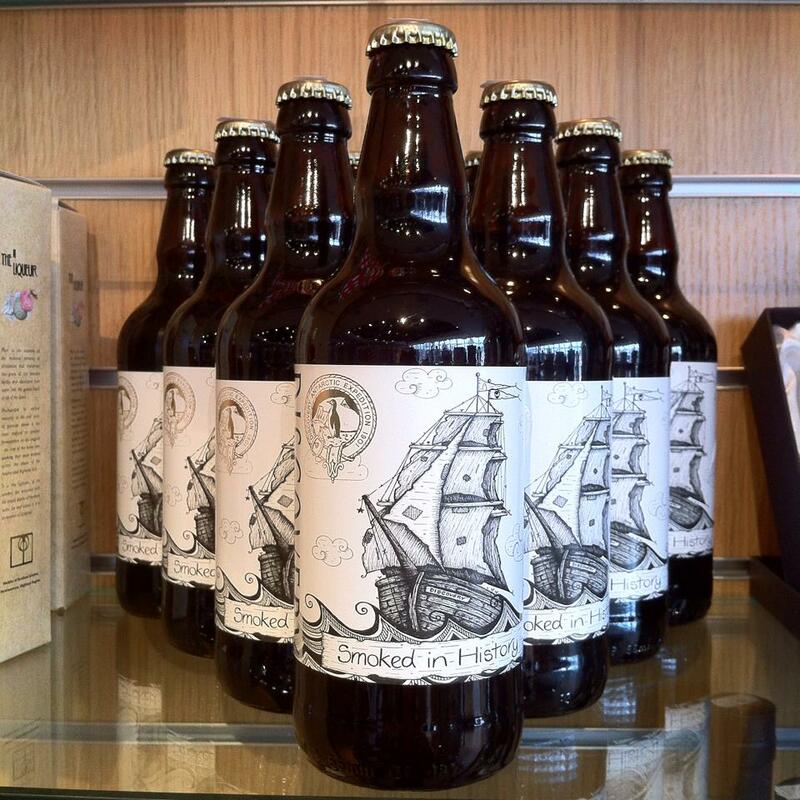 They wanted to make a unique beer to celebrate Dundee, and being the creative types they came up with the idea of burning those leftover timbers from the ship to create a unique smoked flavour for their beer. They were all very delighted with this idea but there was just one thing missing. A label for their beer once it was bottled. It needed a picture. The girl who drew the BrewDog Circus and all the other illustrations popped into the mind of one of the BrewDog guys and he asked her if she would like to come up with something for them and be part of their collaboration. She said no, don’t be ridiculous, that is the worst idea ever and walked out of the bar in a rage. I jest… of course she didn’t! She thought that this was the best thing… maybe ever? Well, almost! She was really very delighted, let’s put it that way. So the girl who loves to draw set about creating a ship for a bottle. 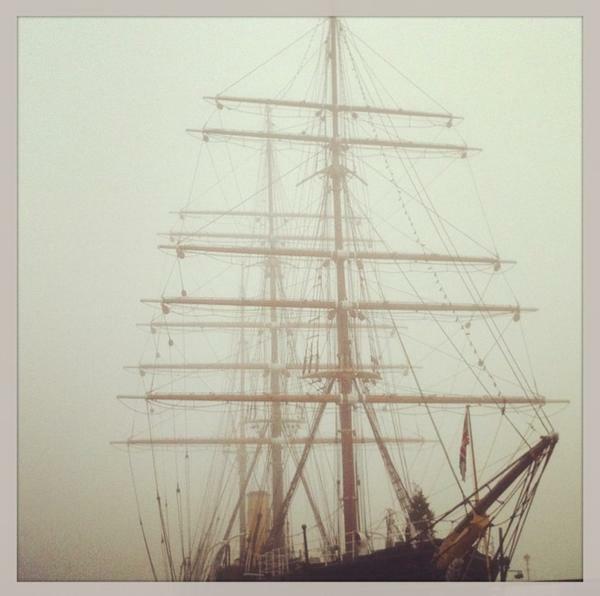 In her mind it had to be a ghost ship as the RRS Discovery is so old. If its sails were to be unfurled today they would be battered and tattered and probably very moth eaten indeed, giving it the look and air of a ghostly pirate ship. After hours drawing at her board, with the finest pens she could find, ‘The Ghost Ship’ was born and sailed onto the labels of ‘Smoked in History’. Find more photos of the Ghost Ship being created here. The beer was launched back in 2014 and was a huge hit. The people’s of Dundee, and many further off places too, loved it and wanted more. But there was no more to be had. They had drunk it all! So what was to be done? 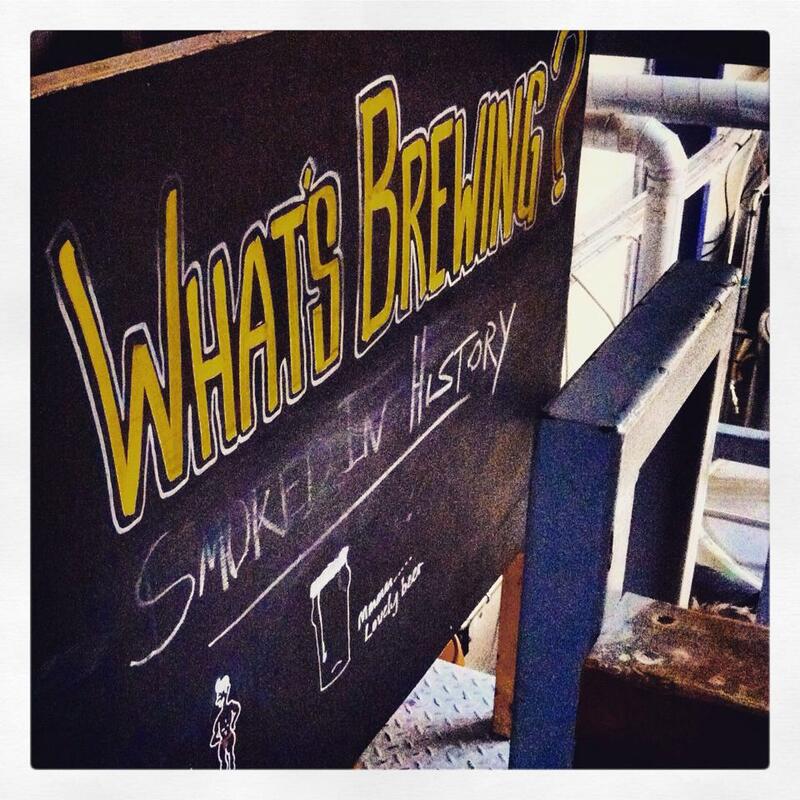 Was ‘Smoked In History’ gone forever? Would only a few people only ever get to taste its robust smoked porter flavours? People were clamouring for more! Something had to be done. This wonderful beer couldn’t be forgotten and relegated to the history books. I would like to introduce another character to our beery tale. There was a man who looked after the RRS Discovery ship, with lots of others too I might add. He had tasted ‘Smoked In History’ and, like everyone else, loved it. He also loved the ship illustration on the bottle. The man decided that this unique beer simply had to be brewed again. Now, the RRS Discovery is still quite a lively ship, even though she is now docked in Dundee and essentially in ship retirement. She loves to invite people to climb aboard and learn all about the adventures that she has been on with her men. This keeps her feeling alive and young again. She also loves to host a dinner party or two throughout the year, where people get to eat from the very same table as her Captain and his crew once ate from. There is one thing that goes without saying with dinner parties and it is that they need drinks as well as food and the man who looked after the ship thought was that it was high time that the ship had a beer of her very own. One that was linked directly to her and one with a story to tell too. So he gathered together the guy from BrewDog Dundee, the other guy from Alechemy and the girl who likes to draw one day, and had a chat with them. 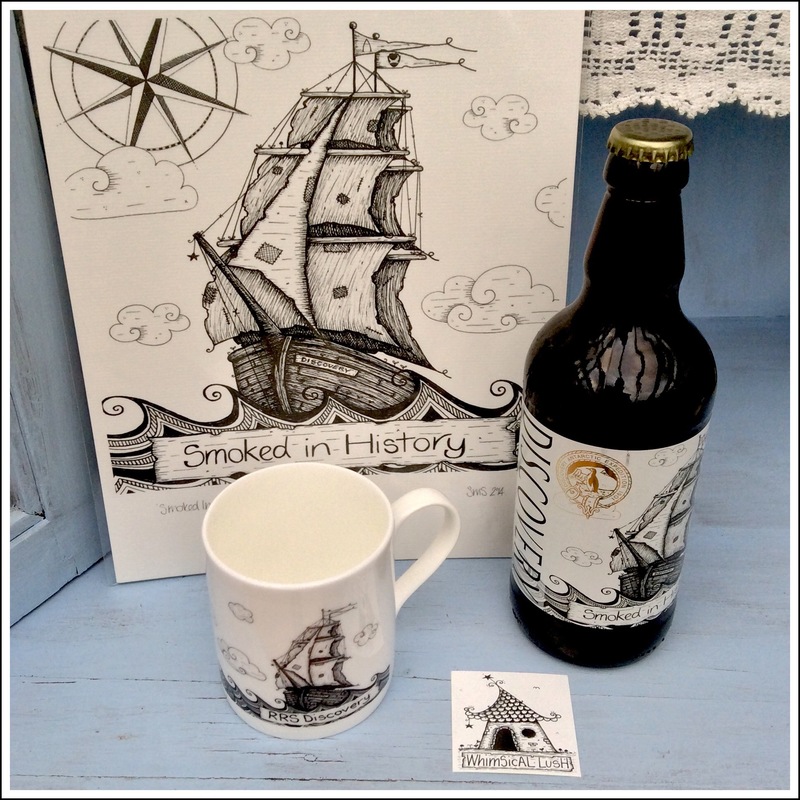 After much chatting and plotting came the second brewing of ‘Smoked in History’, which was now destined to be the official beer of the RRS Discovery. All the people rejoiced and got merry and the clamouring for this very exclusive and super tasty beer started up once again. Those who have found themselves a bottle or glass of this beery wonder have shouted from the highest hilltops about how happy they are once again, and other ponder and plot of ways to get a bottle for themselves. 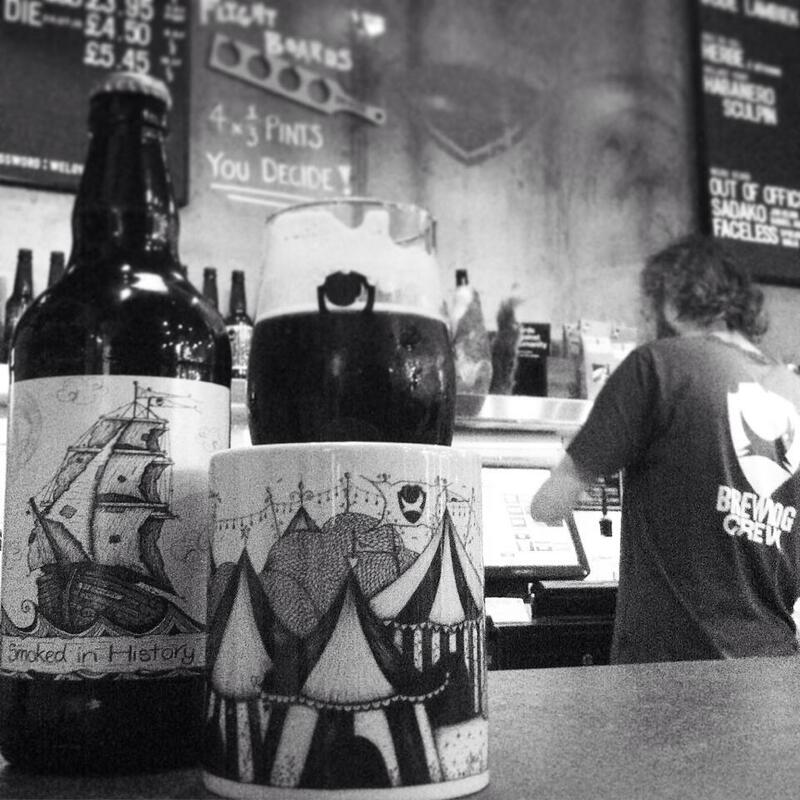 And so here ends the beery tale of the Ship on the Bottle…. or does it? 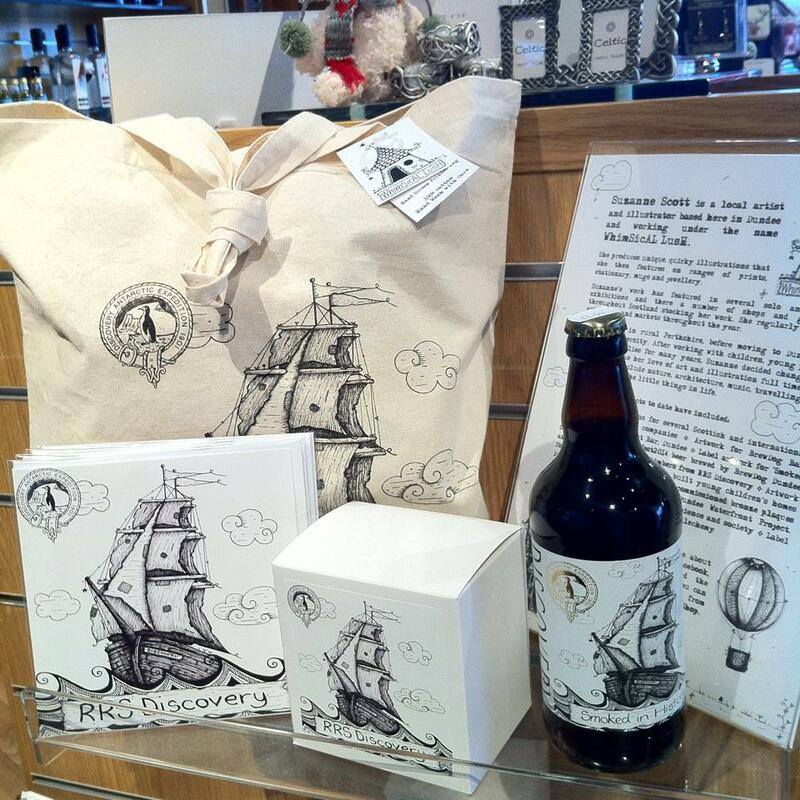 The beer is now served at special events on board the ship, available exclusively to buy in bottle from the Discovery Point gift shop and from BrewDog Dundee. 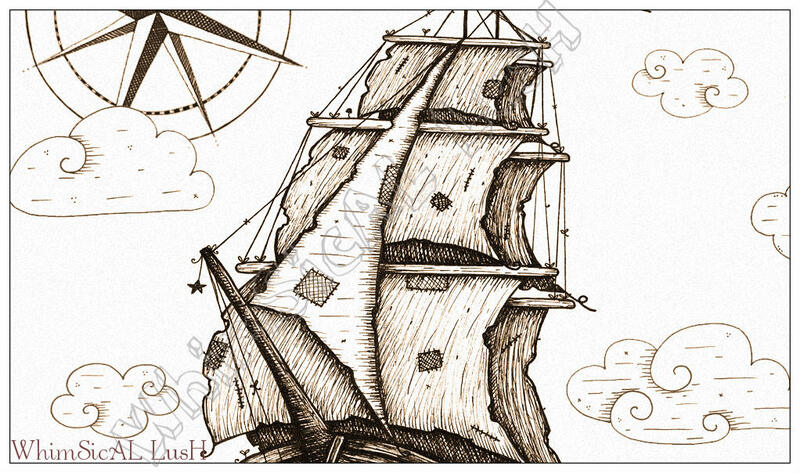 Did you know part 1: The man on the ship loved the ‘Ghost Ship’ illustration so much that he asked the girl who likes to draw to put it onto beautiful bone china mugs, cotton bags, cards, notebooks, framed prints, T-shirts and postcards so that they could sell them in the ship’s gift shop at Discovery Point, Dundee? Well you now know that too…. 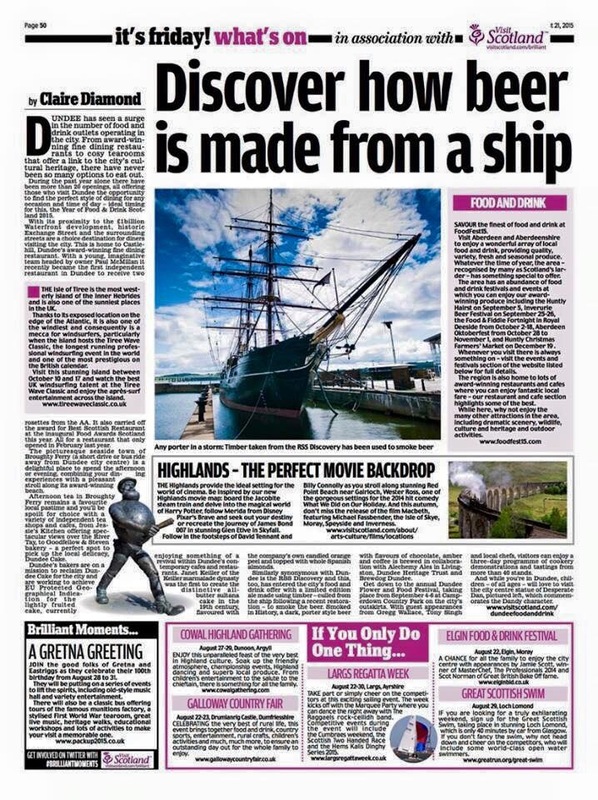 so pop along to the ship next time you are in Dundee and learn more about her wonderful history, her adventure with Captain Scott to the Antarctic, the penguins and take away with you some amazing beer, and ‘Ghost Ship’ souvenirs with an awesome story to tell! Did you know part 3: She went all the way down to Alechemy with her friend from BrewDog Dundee and her rather amazing boyfriend (on his birthday) to brew this second, and very splendid, batch of ‘Smoked In History’? What an awesome day it was too. The guys at Alechemy are so passionate about what they do and so friendly! 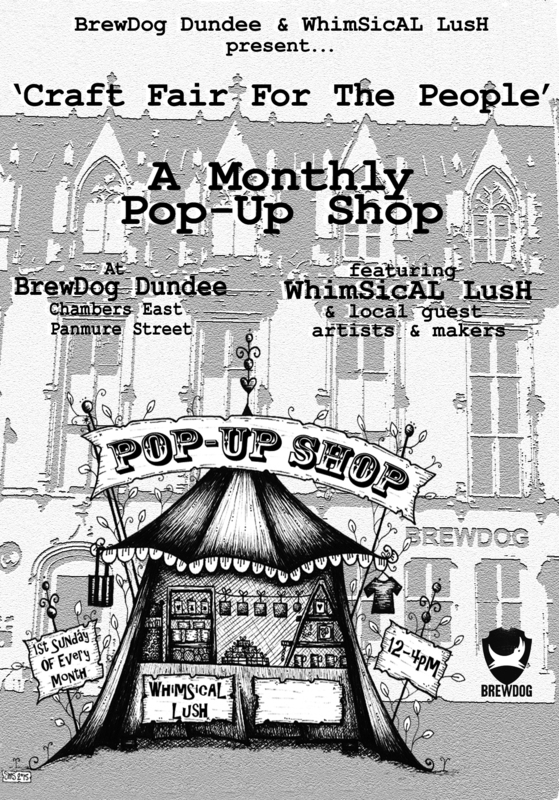 Did you know part four: There is a WhimSicAL LusH pop-up shop on the first Sunday of every month in BrewDog Dundee bar where you can find a whole heap of work for sale, including some ‘Ghost Ships’ too! Well now you that you know everything that there is to know why don’t you come and make a day of it one day by exploring the RRS Discovery ship and then head up to BrewDog to drink a beer with us and find out more about craft beer and illustration and how well they really do go together. Hope to see you soon! Next Post Bring Out The Imp!